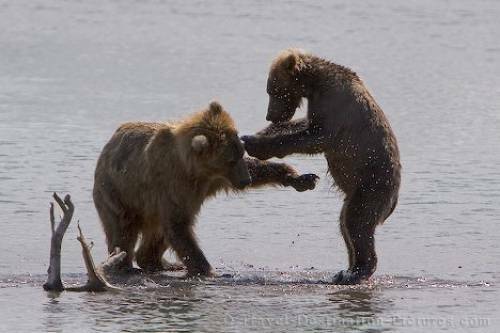 A couple of playful grizzly bears on the banks of Naknek Lake in Alaska, USA. While waiting for the path before and behind us to cleared of bears we watched this pair of younger bears playing around in the shallow waters of Naknek Lake. Picture of two playful bears in the Katmi National Park, Alaska, USA.